I added the Youtube links to the last distro news. You can listen to extracts without having to click everywhere! RUIN (Usa) Spread plague hell Demo tape. Old school death with some obscure and old brutal tendencies. GANGRENE DISCHARGE (Usa) A collection of trauma Demo CDr. Grindcore/ Grindgore with gore vocals. TUMOR NECROSIS FACTOR ALPHA (Can) Tales from the endoplasmic ridiculum Demo tape. Death metal/ Grindcore influenced by old Carcass. Patrons of the rotting gate, 58 pages. A4. In english. 2015. 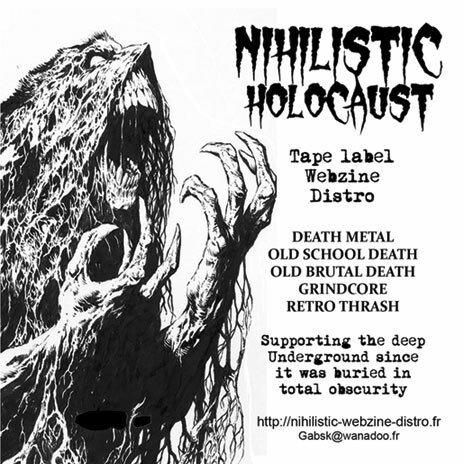 Compilation gathering 19 obscure or not well known bands, in the old school death, obscure death, and strictly death metal related genres. it will take only 10 minutes of your time. FUNEREALITY (Swe) Goregeous Demo tape. Death metal à la Autopsy. OSSUAIRE (Fra) Le troubadour nécrophageophile MCD. Old school death, obscure and brutal. Dropped a link to your distro on my site as well! The CDs were sent a few days ago.